Finding the right tablet for your kid is like for us getting the latest laptop, we need enough processing power to do the so-needed multitasking we desire and when choosing a tablet for your kid the same methodology should be applied, simply cause a little extra investigation will ensure you get the right bang for your buck and will keep your little one learning and entertained all at the same time. Let’s not kid ourselves on here, it’s a booming market and every household has one now, but how to choose a tablet isn’t as easy as buying one, so with a little assistance from here I hope to assist with filtering through some of the low quality and get you a great deal for that child of yours. There are some tablets that have great safety features in mind and some haven’t and instead cater for an older client base, but here we are going to mainly focus on the durable, kid-friendly hand-held device for the young ones, which hopefully will last the test of time. 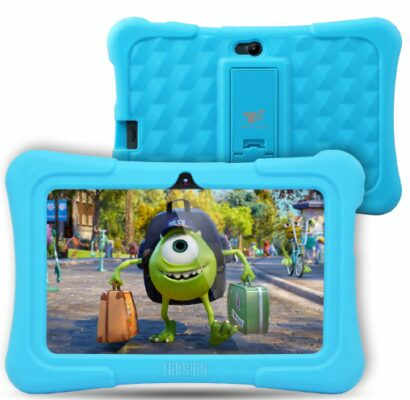 Some tablets range for the 3 to 6 age group and focus on learning games, apps and features themes like Disney, others focus on the 6-8-year-old and others for the young emerging youth so desperately trying to be seen as adults. Here we will try to give a gradual tablet choice as the age gradually changes and go up. This is a tablet that comes in at the low-end and is suitable for children who have never used a tablet before in my opinion, it’s very easy to use and for those kids used to play with more sophisticated devices it might not keep them satisfied, however that being said, the 60 games that are built-in are good educational games and for the low price it’s a fair deal. This device can play in English or Spanish language and the LCD screen is large with speedy technology. This device doesn’t need to be updated and the device comes fully functioning and ready to use arrival. The keypad is fully-functioning and has category bottom, which is easy to use and almost self-explanatory even for the young ones new to iPads and Tablets. Some people have complained that this tablet isn’t sophisticated enough for older kids (6+) so make sure you gauge your child’s development stage, but otherwise, this is a great little tablet. This is another kids tablet but with better function and features than the previous in my opinion, its unlimited gameplay potential means, it has to be a step ahead of its predecessor. This is however reflected in the price and if you’re happy with a slight increase as standard then it’s well worth buying. There are various Disney themed games that come installed as standard but also available on request and download. There are fun games and educational games to be had, plus 10 audiobooks as well as e-books. The pre-installed content is; Monsters University, Brave, big hero and some apps, which are educationally designed. This tablet itself is Disney themed and a sturdy kids handheld device. The screen is 7 inches and of high resolution 1024×600, its processor is quick at 1.3 GHz and the hard drive is 8GB. The operating system is Android and comes with a 2 MP great camera as standard. Easily connects to WiFi and you download content at free will. This is a great tablet for the slightly older ages in my opinion (4+) and with the silicone protecting case the 7-inch screen should be safe without any breaking issues. So, if you want your kid to access apps, games, content online and various websites cause already they are up to date with Google and the wide web then this is a good choice at an affordable price. This leaping green frog tablet designed for kids is a 7 inch bundle of energy and a favorite with ages between 3 to 9 years. This has a whopping 1,000+ games and although sold separately the library is extensive and easy to use for both you and the child in question. There is parental control and you safeguard your children if you feel they are getting a little too inquisitive on the big wide web. This tablet offers a crisp high-resolution screen with touch capabilities. The graphics card is powerful and will ensure an enjoyable user experience. The tablet comes with protective screen complete with an LCD shatter-safe encasing as well as bump protective manufacturing material inside, so those times it gets dropped won’t make too many problems, but of course within reason. The 8GB memory is the best so far in this comparison and with cameras, music players, video recording capabilities it’s a great tablet. This is another good choice with animation content from DreamWorks, which have done lots of educational content like National Geographic and for the younger children entertaining shows like Sesame Street. This came from the collaboration with Common Core and STEM and has solid content as a consequence. 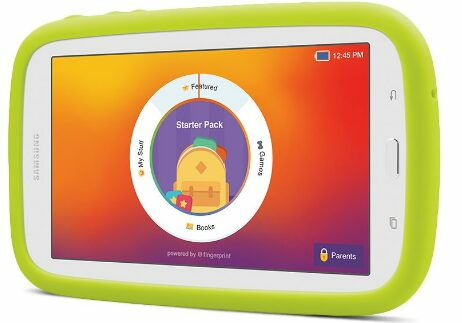 This tablet comes with great parental guidelines and time-set limits, which is good for those wishing to monitor the child’s development and screen time. The 7-inch screen and 8GB makes it competitive with others in the price range and is relatively fast with 1GB of Ram. The device comes with a starter pack and the app equivalent value of roughly half the tablets itself. On purchase the handset there is a free 3-month trial, however, there are unlimited games with no purchase requirement if preferred. This tablet is another one in the range with a good capacity of up to 200GB via the micro-SD and internal of up to 16GB, which is a nice as a default capacity. This allows for downloading the potential of thousands of books, games and various content, which is all accessible via the available channels. The camera has both front and rear capacity and takes photos as most modern phones can and with the 7-inch screen the fire here is fully equipped and ready to use. There are some good warranties out and available with many of the distributors and the case is kid proof, which will keep you rest assured. There is parental control and you can manage the content, time spent and various other things too as a precaution. 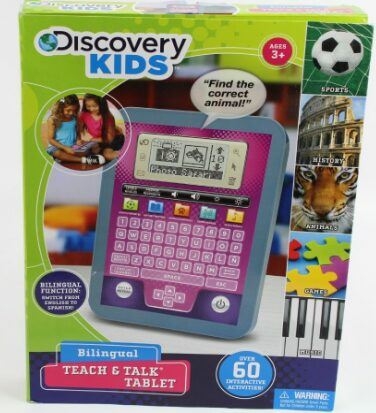 This is an MD-range tablet and can be ideal for a wide range of kids. The Samsung Galaxy is in my view the best overall and offers some great content like National Geographic, Dreamworks, and Sesame Street, which are all known and trusted via respectable companies and aligned in making your kids get a great viewing and playing time. There is also prepaid content that comes with this tablet and with this, the kids can get off to a flying start. 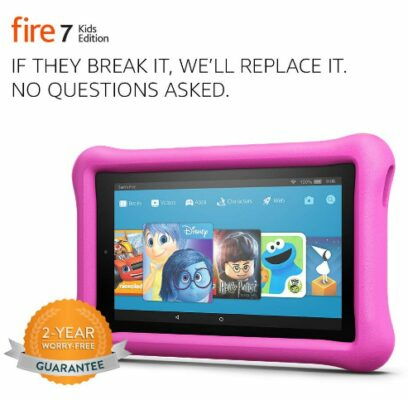 The screen is a good 7 inch, flash memory is 8GB and the memory is 1G, which is a good standard for the children looking to enjoy a user experience. There are unlimited games available on request and in the in-app purchases, which means this toy will last the test of time. The Dragon touch is great value for money and will give the kids hours of entertainment at an affordable price. The tablet comes with free Disney content and some educational pre-installed apps, which when added with 10 audiobooks this really will keep the kids entertained. This comes with parental control features and will ensure the kids are kept heading down the right path when accessing online content, videos, and websites. The screen is sharp with 178° angle, which is wide and furthermore, 1GB RAM will keep things moving from app to app in a timely manner. The case that comes is good for protecting the hardware and will ensure the device lasts the test of time.